Jack Layton from NDP's is the new leader of the official opposition. 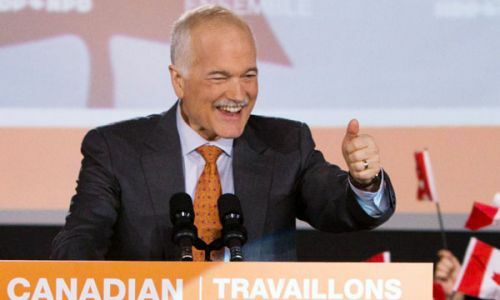 Jack Layton is Canada's new leader of the official Opposition. Following a stunning NDP performance at the polls on may 2, 2011 Monday, vowed to challenge the new majority Conservative government when it's "off track" and to work with Stephen Harper to "get things done" for families. The new leader of the official opposition Jack Layton promised to focus on economic growth, lifting Canadians out of poverty, tackling climate change and making Canada a "voice for peace" in the world. Stephen Harper is back as Canada's prime minister and this time he has the majority government he was hoping for. The Leader of the Liberals Michael Ignatieff has conceded defeat in tonight's election after his party suffered a crushing loss in the election. He offered his congratulations to Prime Minister Harper and the leader of NDP Jack Layton, who both finished ahead of his Liberals. The Leader of Bloc Quebecois Gilles Duceppe says he is resigning as head of the party. Duceppe has lost his Montreal riding after a 21-year run. The Conservatives won 167 seats, followed by the NDP with 102, Liberals with 34, The Bloc Québécois with 4 and the Green Party with 1. A party needs to capture 155 seats to win a majority in the House of Commons.